In usability testing, participants have commented on the fact that they cannot see today's date at a glance because there is not enough contrast between today's date that is highlighted and the rest of the calendar. 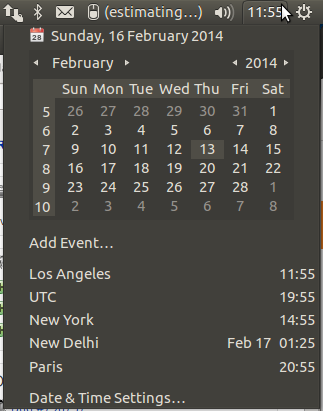 <https://wiki.ubuntu.com/TimeAndDate#menu-calendar>: "If a date item is the currently highlighted menu item, it should have the normal text and background highlight colors for a menu item. If a date has at least one event, its text should be bold. And today’s date should have a thin border around it in the unhighlighted text color." Design spec needs to be changed for this. Specification updated. <https://wiki.ubuntu.com/TimeAndDate?action=diff&rev2=52&rev1=51> "If a date item is the currently highlighted menu item, it should have the normal text and background highlight colors for a menu item. If a date has at least one event, its text should be bold. And today’s date should have a thin border around it in the unhighlighted text color." Also, if you browse to a different date (e.g. several months in the future), there is no quick way to get back to today's date. Clicking on today's date in the drop-down menu should bring the calendar back to today's date. Брат, почини. Ибо напрягает и превращает жизнь некоторых людей в сплошную тьму с этим ужастным отображением. Bug confirmed but is ubuntu-themes even related or is it a problem specific to the calendar widget?